While Python isn’t purely an object-oriented language, it’s flexible enough and powerful enough to allow you to build your applications using the object-oriented paradigm. One of the ways in which Python achieves this is by supporting inheritance, which it does with super(). Free Bonus: 5 Thoughts On Python Mastery, a free course for Python developers that shows you the roadmap and the mindset you’ll need to take your Python skills to the next level. If you have experience with object-oriented languages, you may already be familiar with the functionality of super(). If not, don’t fear! While the official documentation is fairly technical, at a high level super() gives you access to methods in a superclass from the subclass that inherits from it. super() alone returns a temporary object of the superclass that then allows you to call that superclass’s methods. Why would you want to do any of this? While the possibilities are limited by your imagination, a common use case is building classes that extend the functionality of previously built classes. Calling the previously built methods with super() saves you from needing to rewrite those methods in your subclass, and allows you to swap out superclasses with minimal code changes. If you’re unfamiliar with object-oriented programming concepts, inheritance might be an unfamiliar term. Inheritance is a concept in object-oriented programming in which a class derives (or inherits) attributes and behaviors from another class without needing to implement them again. Here, there are two similar classes: Rectangle and Square. In this example, you have two shapes that are related to each other: a square is a special kind of rectangle. The code, however, doesn’t reflect that relationship and thus has code that is essentially repeated. In this example, Rectangle is the superclass, and Square is the subclass. Because the Square and Rectangle .__init__() methods are so similar, you can simply call the superclass’s .__init__() method (Rectangle.__init__()) from that of Square by using super(). This sets the .length and .width attributes even though you just had to supply a single length parameter to the Square constructor. When you run this, even though your Square class doesn’t explicitly implement it, the call to .area() will use the .area() method in the superclass and print 16. The Square class inherited .area() from the Rectangle class. Note: To learn more about inheritance and object-oriented concepts in Python, be sure to check out Object-Oriented Programming (OOP) in Python 3. What Can super() Do for You? So what can super() do for you in single inheritance? Like in other object-oriented languages, it allows you to call methods of the superclass in your subclass. The primary use case of this is to extend the functionality of the inherited method. Caution: Note that in our example above, super() alone won’t make the method calls for you: you have to call the method on the proxy object itself. Here you have implemented two methods for the Cube class: .surface_area() and .volume(). Both of these calculations rely on calculating the area of a single face, so rather than reimplementing the area calculation, you use super() to extend the area calculation. Also notice that the Cube class definition does not have an .__init__(). Because Cube inherits from Square and .__init__() doesn’t really do anything differently for Cube than it already does for Square, you can skip defining it, and the .__init__() of the superclass (Square) will be called automatically. super() returns a delegate object to a parent class, so you call the method you want directly on it: super().area(). Not only does this save us from having to rewrite the area calculations, but it also allows us to change the internal .area() logic in a single location. This is especially in handy when you have a number of subclasses inheriting from one superclass. Before heading into multiple inheritance, let’s take a quick detour into the mechanics of super(). While the examples above (and below) call super() without any parameters, super() can also take two parameters: the first is the subclass, and the second parameter is an object that is an instance of that subclass. In this example, you are setting Square as the subclass argument to super(), instead of Cube. This causes super() to start searching for a matching method (in this case, .area()) at one level above Square in the instance hierarchy, in this case Rectangle. In this specific example, the behavior doesn’t change. But imagine that Square also implemented an .area() function that you wanted to make sure Cube did not use. Calling super() in this way allows you to do that. Caution: While we are doing a lot of fiddling with the parameters to super() in order to explore how it works under the hood, I’d caution against doing this regularly. The parameterless call to super() is recommended and sufficient for most use cases, and needing to change the search hierarchy regularly could be indicative of a larger design issue. What about the second parameter? Remember, this is an object that is an instance of the class used as the first parameter. For an example, isinstance(Cube, Square) must return True. By including an instantiated object, super() returns a bound method: a method that is bound to the object, which gives the method the object’s context such as any instance attributes. If this parameter is not included, the method returned is just a function, unassociated with an object’s context. For more information about bound methods, unbound methods, and functions, read the Python documentation on its descriptor system. Note: Technically, super() doesn’t return a method. It returns a proxy object. This is an object that delegates calls to the correct class methods without making an additional object in order to do so. Now that you’ve worked through an overview and some examples of super() and single inheritance, you will be introduced to an overview and some examples that will demonstrate how multiple inheritance works and how super() enables that functionality. There is another use case in which super() really shines, and this one isn’t as common as the single inheritance scenario. 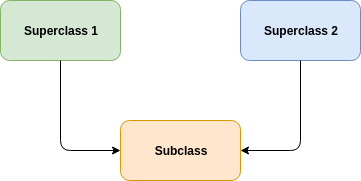 In addition to single inheritance, Python supports multiple inheritance, in which a subclass can inherit from multiple superclasses that don’t necessarily inherit from each other (also known as sibling classes). Note: The term slant height may be unfamiliar, especially if it’s been a while since you’ve taken a geometry class or worked on any pyramids. The slant height is the height from the center of the base of an object (like a pyramid) up its face to the peak of that object. You can read more about slant heights at WolframMathWorld. This example declares a Triangle class and a RightPyramid class that inherits from both Square and Triangle. You’ll see another .area() method that uses super() just like in single inheritance, with the aim of it reaching the .perimeter() and .area() methods defined all the way up in the Rectangle class. Note: You may notice that the code above isn’t using any inherited properties from the Triangle class yet. Later examples will fully take advantage of inheritance from both Triangle and Square. Did you guess that Python will try to call Triangle.area()? This is because of something called the method resolution order. You may recognize this from geometry class as the formula for the area of a triangle. Otherwise, if you’re like me, you might have scrolled up to the Triangle and Rectangle class definitions and seen this same code in Triangle.area(). The method resolution order (or MRO) tells Python how to search for inherited methods. This comes in handy when you’re using super() because the MRO tells you exactly where Python will look for a method you’re calling with super() and in what order. This tells us that methods will be searched first in Rightpyramid, then in Triangle, then in Square, then Rectangle, and then, if nothing is found, in object, from which all classes originate. The problem here is that the interpreter is searching for .area() in Triangle before Square and Rectangle, and upon finding .area() in Triangle, Python calls it instead of the one you want. Because Triangle.area() expects there to be a .height and a .base attribute, Python throws an AttributeError. Notice that RightPyramid initializes partially with the .__init__() from the Square class. This allows .area() to use the .length on the object, as is designed. You see that the MRO is now what you’d expect, and you can inspect the area of the pyramid as well, thanks to .area() and .perimeter(). There’s still a problem here, though. For the sake of simplicity, I did a few things wrong in this example: the first, and arguably most importantly, was that I had two separate classes with the same method name and signature. This causes issues with method resolution, because the first instance of .area() that is encountered in the MRO list will be called. When you’re using super() with multiple inheritance, it’s imperative to design your classes to cooperate. Part of this is ensuring that your methods are unique so that they get resolved in the MRO, by making sure method signatures are unique—whether by using method names or method parameters. The next issue here is that the code doesn’t have a delegated Triangle object like it does for a Square object, so calling .area_2() will give us an AttributeError since .base and .height don’t have any values. All methods that are called with super() need to have a call to their superclass’s version of that method. This means that you will need to add super().__init__() to the .__init__() methods of Triangle and Rectangle. Redesign all the .__init__() calls to take a keyword dictionary. See the complete code below. kwargs is modified in some places (such as RightPyramid.__init__()): This will allow users of these objects to instantiate them only with the arguments that make sense for that particular object. Setting up named arguments before **kwargs: You can see this in RightPyramid.__init__(). This has the neat effect of popping that key right out of the **kwargs dictionary, so that by the time that it ends up at the end of the MRO in the object class, **kwargs is empty. It works! You’ve used super() to successfully navigate a complicated class hierarchy while using both inheritance and composition to create new classes with minimal reimplementation. As you can see, multiple inheritance can be useful but also lead to very complicated situations and code that is hard to read. It’s also rare to have objects that neatly inherit everything from more than multiple other objects. If you see yourself beginning to use multiple inheritance and a complicated class hierarchy, it’s worth asking yourself if you can achieve code that is cleaner and easier to understand by using composition instead of inheritance. With composition, you can add very specific functionality to your classes from a specialized, simple class called a mixin. This mixin can be used the same way in any class that has an area defined for it and for which the formula area * height returns the correct volume. In this tutorial, you learned how to supercharge your classes with super(). Your journey started with a review of single inheritance and then showed how to call superclass methods easily with super(). You then learned how multiple inheritance works in Python, and techniques to combine super() with multiple inheritance. You also learned about how Python resolves method calls using the method resolution order (MRO), as well as how to inspect and modify the MRO to ensure appropriate methods are called at appropriate times.